At AMC DINE-IN Theatres around the country, the huge movie theatre franchise, will now be serving “latest crowd-pleasing, chef-inspired options.” IN addition to their Loaded Nachos, Chicken Tenders, and Pretzel Bites, you can now order Korean BBQ Bacon Buns, BBQ Brisket Mac & Cheese, Artisan Pepperoni Flatbread, and Molten Chocolate Churros. At AMC DINE-IN™, we treat each and every dish as if it’s the star of the show. Our chefs use only the freshest ingredients to handcraft mouthwatering options, and it’s all made in house and made to order. Choose from our menu of appetizers, entrees and desserts. Just remember to save room for the movie! Except for the flatbread, each new menu items goes well over 1,000 calories with the Triple Chocolate Brownie Sundae (1490) and Loaded Basket Fries (1370) the worst offenders to your hips. You can browse AMC’s new menu here so you’re not still trying to figure out what “I’m feeling like today” four previews in. 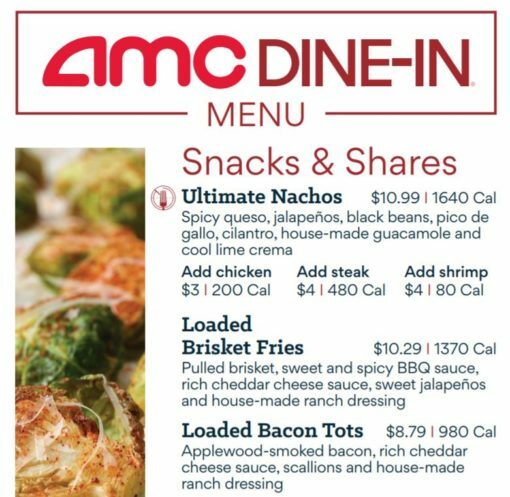 AMC has been upgrading their movie-going experience to keep with the times, their customer’s expectations as well as competitors like Alamo Drafthouse and independent chains offering alcohol and unique menu items. You can’t just keep serving stale popcorn with “real butter” and Sourpatch Kids if you want to stay relevant.